We know you're thinking that grilling tomatoes sounds a little strange at the very least. Grilling a tomato does so much for the flavor. You simply have to try it to understand. In fact, try this: Take a tomato, cut it in half, and sprinkle with salt and pepper, grill, cut side down for about 5 minutes. Now, take a bite. The flavor of the tomato becomes intensified by grilling it. You also get a great flavor from the browning of the tomato. Since tomatoes are naturally high in sugar the grill caramelizes those sugars and gives the tomato some really great flavor. To grill a tomato, start by cutting out the stem end and then cut the tomato in half. You can grill them whole, but they tend to explode and not in a cool, dramatic way. There are two ways to actually grill the tomato and it depends on what you want to get out of it. 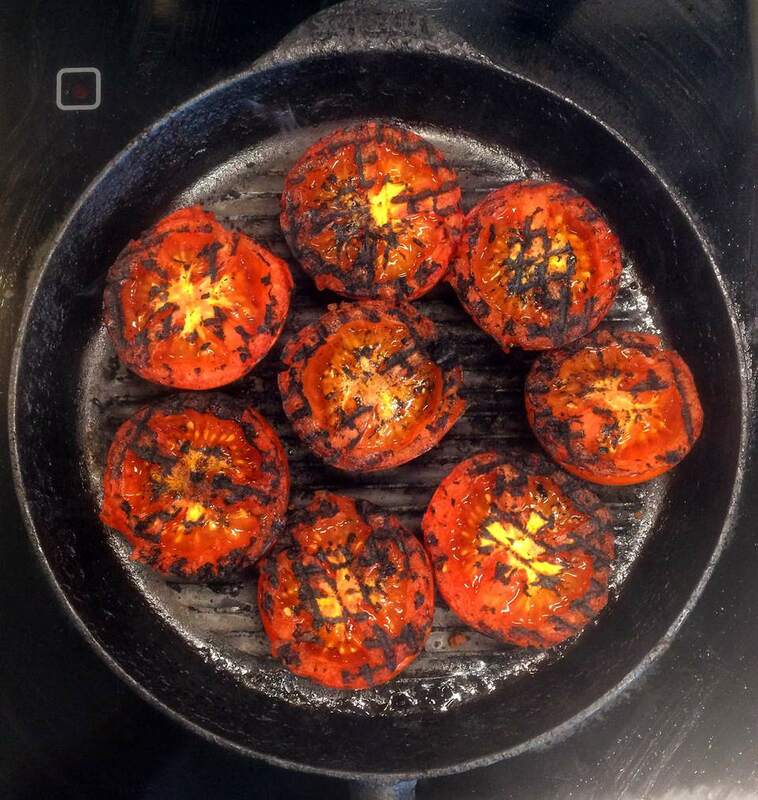 If you want to serve up your tomatoes as a side dish or appetizer then grill them face down for two to three minutes then flip them over to finish off. It's at this point that you can sprinkle on garlic, cheese or whatever you want to season your tomatoes with. If you want to make a salsa or sauce out of your tomatoes then you only need to grill them face down. Either way, any part of the tomato that is going to be in contact with the grill needs to be lightly oiled. Brush a little olive oil over the surface of the tomato and it won't stick. Most of this oil will be lost to the grill so you really are not adding much fat. Don't use too much or you might get flare-ups which will ruin your tomatoes. If you want to use your grilled tomatoes in something like a marinara sauce or salsa you will want to get them lightly browned on the cut side, but you don't want to overcook them. Tomatoes will go from firm to squishy in a few minutes on your grill. The best way to tell when the tomatoes are perfect is to try and pull off the skin with your fingers. Cooking a tomato separates the skin from the flesh, so when the tomato is ready you can lift the skin right off it. This is similar to the blanching trick with tomatoes, but instead of robbing the tomatoes of flavor and nutrients by dropping them in boiling water, the grill adds to the tomato. By cutting the tomatoes open you will drain out some of the water and seeds making them practically perfect for sauces. If you want all the seeds gone you can simply squeeze it out before you throw them in a pot to make your sauce. To make your tomatoes into a side dish or appetizer, prepare them as you would above, but use an olive oil seasoned with salt, pepper, herbs, and spices. Grill them for about two minutes cut side down then turn them over and load them up with cheese, nuts, seasoned bread crumbs or whatever else you want. So no matter what you want to do with your tomatoes, consider the grill to add flavor and make them something truly spectacular.